The houses woke to the sound of axes. Shirt-sleeved men swinging silvery axes were chopping a wedge out of the bottom of a huge tree. By the time we had dressed and rushed out, there was a wound nearly a foot deep on one side of the trunk and a man with spiked boots was walking up the tree leaning backwards against a belt. Well above the first branch he fastened a wire cable round the tree and slid down. Children crowded near but the men waved us back to a safe distance, where we stood silent and astonished. The end of the wire was taken far away from the tree to a large metal machine which had a lever like a railway signal-box points lever. This machine was anchored to the base of another tree and the cable levered taut so that when the tree fell, it would fall in a safe direction, as the men required. Now two men took a long, double-handed saw with enormous teeth and sawed from the other side of the trunk towards the wedge. 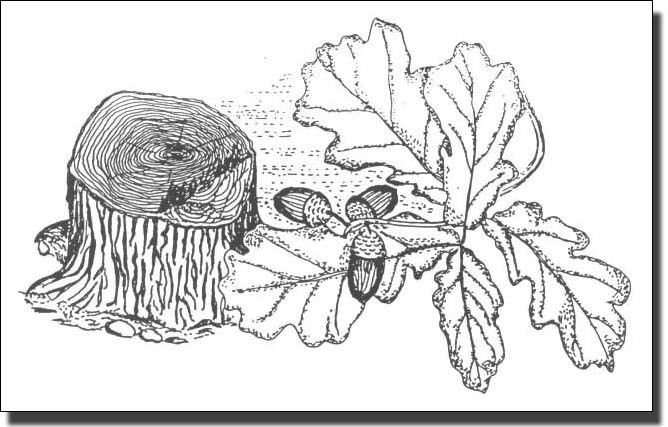 The sharp smell of fresh-cut oak, a smell that would evoke live oak trees all our lives, filled the air. That sharp tang of pyrogallic acid is like no other smell on earth, clearing the brain like wine. 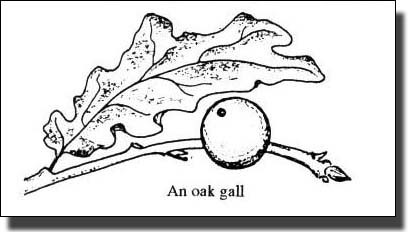 Other woods have their own smells but oak has a special sharpness. As the saw bit deeper and deeper into the trunk, the hawser was drawn tighter and, at last, there was a slight movement. The men released the saw and ran to drag on the steel lever. Slowly the tree moved towards them and a space opened up in the sky as the huge canopy of branches fell to the ground, dragging in a gush of light. Great branches cracked like sticks under the impact. Twigs littered the ground and, finally detached, broken from its branch but still closely woven and complete, was a bird's deserted nest which I kept for years. By the time we came back from school, almost a dozen fine trees had been felled. The lumberjacks had sawn or chopped off the side branches so that the trunks were stripped ready for carters to take them to the timber yard. Larger branches were stacked, ready to be carried away, but the smaller pieces still littered the ground. Instead of a dense wood there was an open prairie with flat-topped tree trunks spaced at intervals and light reached the ground as it had not done for a thousand years. That evening the wood was alive. Children played on the flat tree stumps, jumping on and off in an enormous natural gymnasium. Some young ones sat solemnly round a tea table laid with a toy china tea set and extra acorn cups picked up from the ground. The householders and the older children were gathering winter fuel. Branches were carried off and secreted in gardens all along the road, though how they would ever cut them nobody knew. Many pieces were far too thick for the tiny saws most people owned. Children rested them between stones and jumped on them but only ricked their ankles. Some branches hung about for years, too long to fit into any fireplace, and were finally burnt in some Guy Fawkes blaze years later. Small twigs were gathered in baskets and sheets, to be stacked near the coal cellars to dry. By the next day most of the area had been cleared. After a few days, when plenty of trunks were ready for moving, the timber wains arrived. Not lorries as I remember it, but horse-drawn wains with two pairs of wooden wheels, joined by enormous curved axles which swept up between them. When the wains were drawn forward over the trunks, the curves of the axles stood higher than the trunks. The trunks were winched up below the axle curves to be held suspended a few inches above the ground and the wain was ready to move. Then a team of two, or four, huge shire horses drew the wain away slowly to the local timber yard. At this period London still had its small timber yards, with their power saws and stacks of timber being seasoned slowly in open-sided sheds. When the great hurricane struck London in 1987, a wealth of timber was felled, but by then there was no local equipment to deal with it. In the end large amounts of good timber were turned into mere fibreboard, soulless and dull, because there were no saws to cut it up. In 1925 England was still in an early manufacturing age, doing many things as they had been done a century earlier. Building and construction were still largely handworked, with processes carried out by traditional handicraft methods, using long-remembered skills. 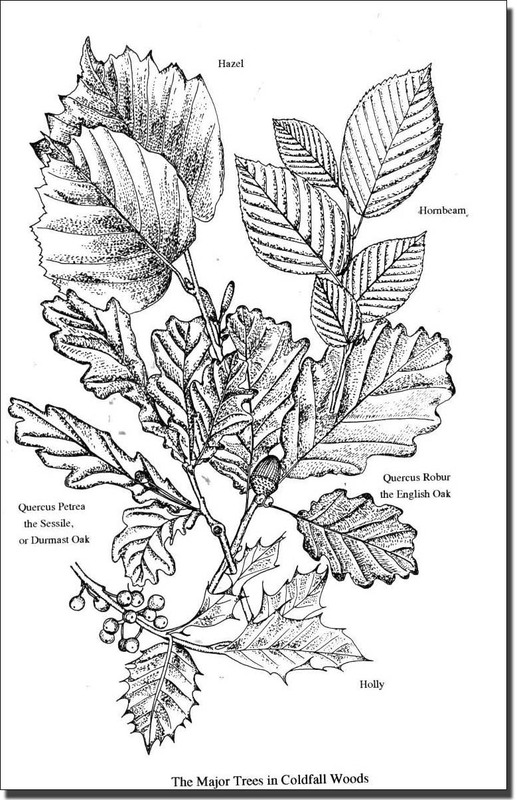 These trees would be cut in local yards to make oak fencing for perhaps quite local use. Ever since they had begun cultivating their gardens, the householders had made secret attacks on the wood for leaf-mould. This litter layer, far thinner then they had expected, had been taken in small amounts. A pail here and a pail there to help a particular plant, or lighten the soil along a row of beans. Now, with the area cleared and building about to start, this was their last chance. People went out with pails in both hands and returned to build small heaps of rich black leaf mould to enliven their heavy clay. We children were fascinated by the flat tops of the tree stumps. We tried to count the annual rings to find the age of one large tree. We knew that a tree adds one ring each year and these ones were clear to see. Start at the middle and count outwards. That gave the age of the tree, but we continually lost count. In the end I went back to the house and collected the nails left over from making the rose pergola and the full collection of tools the house could provide - a coal hammer and a gimlet. A ludicrous kit. There had been a proper hammer, used to build the pergola, but I could not find it. Presumably it had been left in the garden and would turn up later. The coal hammer, which weighed about a pound and a half, was very far from a carpenter's tool. A rough forged head, straight from the steam hammer, with a straight pane like a blunted axe blade at one end and a four-sided point at the other. 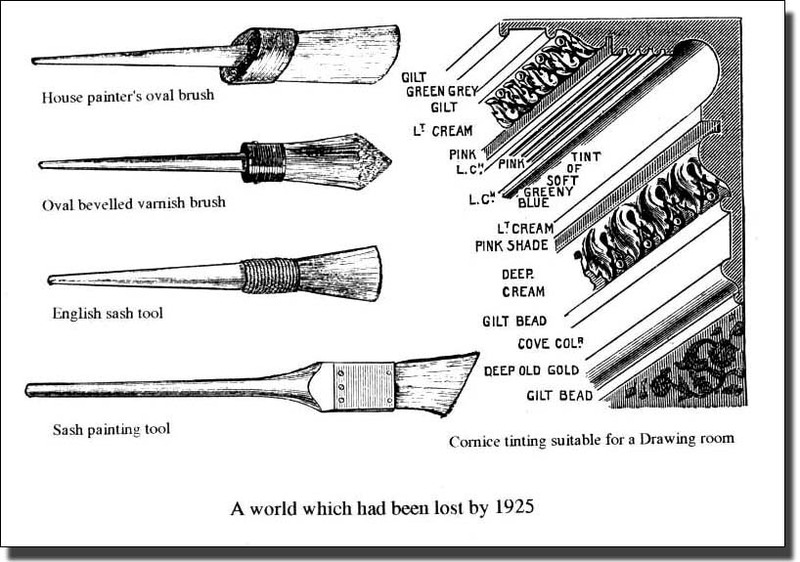 It would break coal well enough, but hitting a nail was another matter, while the gimlet was a tool of the devil. It was like a corkscrew, with a wooden handle across the top. In theory one pushed the point into the wood and slowly twisted so that it screwed into the wood, cutting a neat hole. In fact, the point was blunt and the tool would skid rather than penetrate. We were not well equipped, but fortunately we did not realise this. Back at the tree trunk we carefully counted ten rings from the centre and hammered in a nail. It was very difficult. The hammer point was too small and rounded and the straight pane too narrow for us to be able to hit a nail cleanly. In the end, after several missed strokes and barked fingers, we took to hitting with the flat side of the hammer and made some progress. Slowly the nails moved across the trunk at ten year intervals until there were twenty-three nails and three more rings outside. After a lot of discussion we agreed that this made 233 rings and that was the age of the tree. "Yes. He was the first German. Never spoke a word of English you know." This was one of those shocks that one remembers all one's life. A king of England who did not speak English and, more than that, a German! It was 1926 by now and we children had all those blind prejudices that young people absorb through their pores. Three years earlier, at my previous school, I had moved from the Infants to the Junior School. To celebrate, my Mother had bought me a satchel unlike any worn by any other child in the class. It was brown canvas, with short crossed straps so that it sat high up on the shoulder blades, instead of hanging by the hip like any respectable satchel. I was horrified. "I can't wear that. It's German." Mother did not try to persuade me, but went back to the shop and changed it. This was when Germany was trying to rescue her economy from the pit of despair by expanding its exports. The Dawes Plan to rescue German children from starvation had only just been agreed, and here was one export being rejected by a boy who had to be like his friends. The Germans were still the enemy and suddenly I had discovered that a British king was German. Meanwhile the felling continued until there were no trees still left behind the houses. Clear land as far as the field edge. Brown, not green. All was stumps and devastation. The woods to the right were still there, but our original row of houses would never again look out on the verdant forest and some of the romance was gone. Only the people of Barrenger Road, in the far corner of the unbuilt Estate, were to have trees up to their back gardens for ever. When the timber had been removed, the slope became a pattern of tree stumps, dotted like mushrooms. Then men with pickaxes and narrow digging spades cut round each stump, chopping off the roots, exposing the sides, undercutting where possible. A chain was passed round the exposed stump and a huge shire horse, its flanks shining and glistening with sweat, pulled and heaved until the stump began to move. At that moment Phyllis, my sister, after the first occcasion, turned away and winced, for no sooner did the stump move than the carter cut the horse violently with his whip. Each time this produced a frenzied whinny and a scrabbling with the hooves as the horse dragged harder and the stump broke clear. Soon Phyllis could bear it no longer and ran home crying, with me following, trying to comfort her. By the time we ventured back next day the stumps had been piled in long heaps and burning had started. Not with great blazes, but slow combustion, tardy and fitful because the wood was wet and full of sap. The men kept returning to their fires, pushing them together as the centres burnt to ash, shaping the mounds and coaxing the stumps to burn. A few days later there were piles of wood ash all over the site and unlevelled pits left from the tree stumps. The burnt-out watch fires of a vanished army near their abandoned fox holes. When I pointed this out to my father he said, "Too much like Flanders", and refused to say another word. The more knowledgeable gardeners collected some of the wood ash to put on their flowers, but most of it washed away. By the autumn weeds and grass had sprung up, colonising a landscape which had, for centuries, been too shady for them to grow. Within a month there were men marking out the site with pegs and strings in a way that we children could not understand. Trenches were dug for no apparent reason. Great heaps of gravel and sand arrived in two wheeled carts, drawn by the inevitable shire horses, with their huge hooves and hair-fringed anklets. These carts were always exciting because the carter backed them into position, pulling on the cheek harness where it met the horse's bit until the cart was in the correct place. Then he knocked out a holding wedge and the cart body tipped up, suddenly and violently, depositing its load in exactly the right position. ++ should cart picture go here? These mountains of sand and gravel were to be features of the landscape for some years to come. Each time the same process was repeated. Two or three men began wheeling so many barrowloads of sand, so many barrows of gravel, so many sacks of cement, into a huge pile which they turned until it was all the same grey-yellow colour. Then they made a hole in the centre, filled it with water and carefully turned the dry mixture into the centre. Steady turning, controlling the water so that it could not escape from the centre, watchful mixing, to produce a great lake of concrete, ready to be poured into the narrow trenches to form foundations for the houses. This mixing process would be repeated along road after road, year after year, as the houses were built and the estate was completed. The first mix was for foundations. They would use different proportions and different materials for the bricklaying mortar, but the process of batch mixing would be used on all occasions, for there were no concrete mixers. No ready-mix concrete was delivered to the site in revolving conical vases, carried on huge lorries. These machines were still light years away. Bricks were delivered by lorry, or cart, and unloaded one by one. The impression the whole time the estate was being built was of armies of men, with their different skills, working by hand, following each other in turn from house to house, without any of the modern machinery we expect today. When the concrete had been mixed, men shovelled it into wheelbarrows which were then wheeled off along lines of planks to the foundation trenches. Two lines of planks, with full barrows moving along one and empty ones returning along the other. Wide wooden barrows, white from the layers of dried on mortar, handles polished by perpet­ual use, wooden wheels hooped with iron. The builders' labourers with their sleeves rolled up, trousers tied with string below the knee, wearing waistcoats, knotted scarves, and flat tweed caps, followed each other up and down the planks. At the trenches other men, more skilled, tamped down the concrete with baulks of wood to pack it tightly into the trenches, forcing the trapped air to the surface so that the concrete would be solid and then placing a long spirit level on top. Only when the bubble in the level lay exactly in the centre was the top of the concrete level and they could move to the next section. These were the bricklayers, kings of the building trade. They never mixed concrete, or wheeled a barrow, or carried a brick. Those were the labourers' jobs. 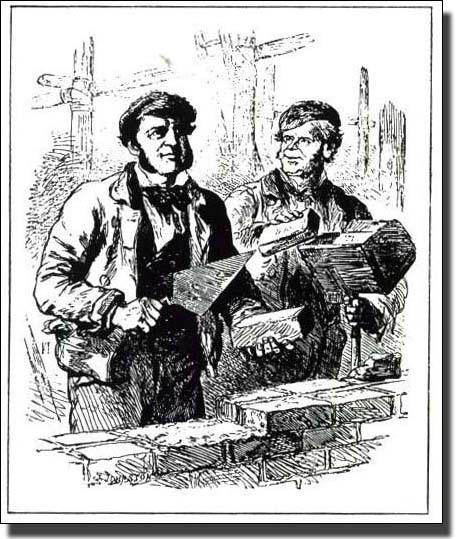 Bricklayers were craftsmen who had served apprenticeships. They got threepence or fourpence an hour more than the labourers and expected everyone to recognise it. 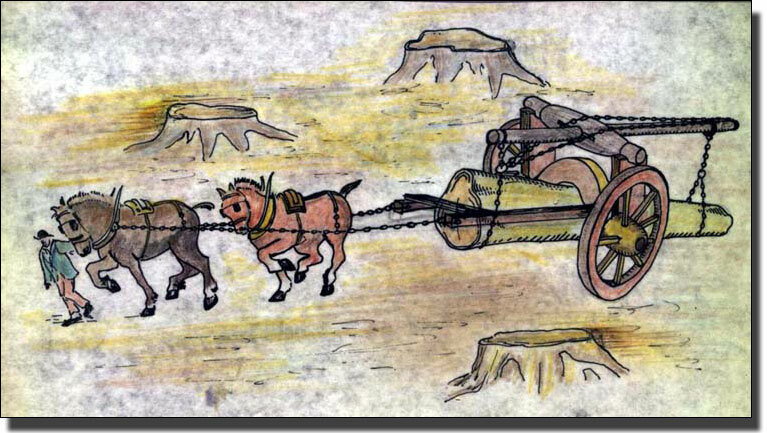 Three days after the first foundations were poured came horses and carts with thousands of bricks. They had been piled into the carts by hand and were taken out in the same way. A man inside the lorry threw them over the side to another man on the ground, who caught them and threw them to a third. The third man stacked them in a neat pile. Flying bricks, caught time after time, without a miss. The men's hands were so hard and calloused that even the sharp brick edges did not cut them. By the pile stood a foreman with a clipboard who counted and checked to make sure that the full number of bricks of each type was delivered. There were Flettons, in one pile, pink and smooth, and in the others, deep red facing-bricks and white/yellow Gaults. When the lorries were emptied the men sat down for a break. They brewed tea in a can over a wood fire, dropping the tea leaves into the water as it boiled, and took out thick sandwiches, or a loaf of bread and a piece of cheese. When the foundation had been laid, the real work could begin. Labourers mixed batches of mortar on a platform made of wooden boards, using sand, lime and cement to make a stiff porridge. When the mortar was ready, they brought forward a tall frame which leant at an angle against two wooden stays. Over the frame was a thick felt blanket made of animal hair, like a huge horse-cloth. They beat the cloth with sticks so that the hairs fell into the mortar, mixed the hairs into the mortar, beat again and mixed again, until the mortar was threaded with hairs. These would hold the mortar together and, years later, I could still recognise them in the tiny gap between the wooden front door frame and the bricks. Hair mortar was the traditional bricklaying material, now long forgotten. The bricks in this wall are not properly bonded. Then the labourers each stacked a dozen bricks in a carrying hod and carried them on their shoulders to the foundations. They built piles of bricks at intervals along the wall and set out mortar on small mixing boards. All was ready for the brickies. Swiftly a bricklayer spread a layer of mortar on the foundations, picked up a red facing brick, examined it to find the best corner and laid it down on the mortar. He tested it with a spirit level in both directions, tapped the high corner with the handle of the trowel and tested again. It appeared so easy. Quick, assured movements, perpetual checking, a well trained eye. We children were fascinated to watch for long periods as the men spread the mortar, buttered the brick and tapped it true. Slowly the walls rose to waist height round the first block of houses. One could see the shape arising, but the rooms seemed so small - rooms for dwarfs. Later, when the men had gone, we paced out the rooms and were surprised to find that they were the same size as our own papered rooms. Now came the scaffolders, quick, lithe men who threw piles of tall larch poles on the ground. These rang out with high, bright notes as they landed on the pile, which became an enormous xylophone. Grown in a forest, close packed like grass, they had shot up straight and tall, with their side shoots weak from lack of light. Now, stripped of bark, with any side shoots cut off and bleached by the sun, they were to be erected as another forest round the new house walls like a giant Meccanno, to be put up and taken down time and again as the building of the estate progressed, in a never ending dance. a square puttock and a scaffolding board. A scaffolder's axe has been pecked into the scaffolding board. to hold it upright and easy to pick up. Nearby would be a huge pile of scaffolding boards with metal cleated ends, and another pile of puttocks,short baulks of timber about four feet long, adzed to about three inches square. These were the cross-members which would carry the scaffold boards, for at this period there was no metal scaffolding. All scaffolding was still of wood, as it had always been. The larch poles were tied together in a square lattice with standard lengths of sisal rope. These ropes, with their neatly whipped ends to prevent fraying, were bound tightly round each joint of the framework in a traditional manner. Scaffolders carried special hand axes with a blade at one end and a sharp point at the other. We children were fascinated at the way these axes were used for a dozen jobs. 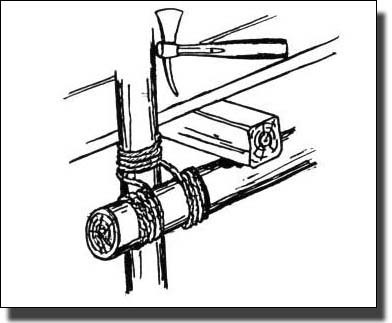 The scaffolders dug the point into a piece of wood to pull it towards them; they wrapped the end of the rope round the axe and levered it tight to bring their poles together; they wound the rope end round the scaffolding pole and the axe tip, removed the axe, slid the rope end through the gap left and pulled it tight. With the axe they bound the scaffolding tight and safe without using one single knot. Without the axe this would have been impossible to achieve. 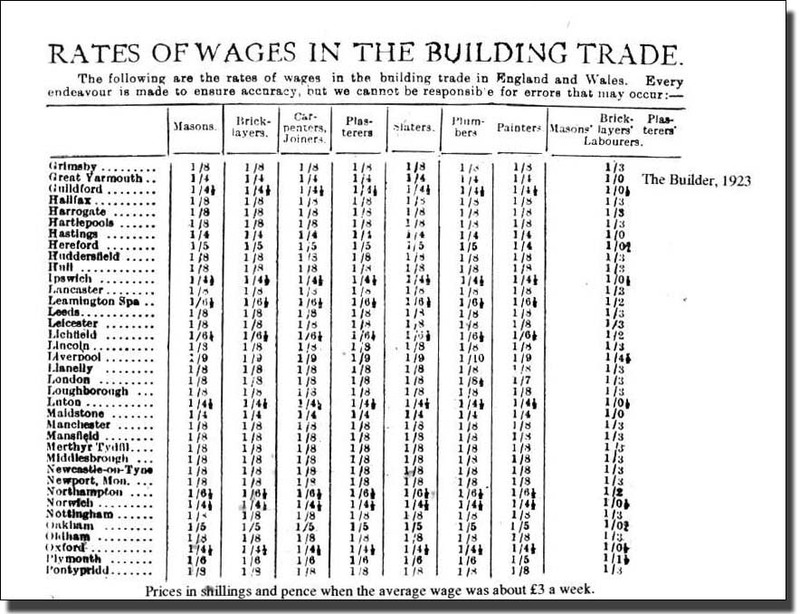 Each fortnight The Builder published the standard wage rates for different trades in different parts of the country and the current prices of building materials. These were used by architects and builders when tendering estimates for work to be done. Surely the most enjoyable job on the new houses was carpentry. Open-shouldered work, using big, sweet smelling materials, cut quickly with sharp saws and nailed vigorously with a fine swinging of the arm. I always enjoyed watching the carpenters fixing their heavy floor joists and then nailing the floor boards with crudely sheared cut-nails. The men never seemed to mind a couple of small children watching through a window, examining everything they did. The carpenters arrived when the bricklayers had finished building the walls. They climbed the scaffolding and began creating the roof. Rafters were cut to standard lengths, with the end joints set at the correct angles with bevels. It was a pleasure to see them cutting so accurately to the thick pencil lines with cross-cut saws. No machinery. There was not a power machine on the site. In 1925, almost everything was done as it had been done a century before. Of course they no longer squared their roof joists with an adze, or sawed them with two-handed saws in saw pits. Those practices had gone out long before. Joists arrived at the site already sawn to width and thickness by power saws; floor boards came machine planed; skirting boards were machine moulded, but from then on everything was cut by hand. No small electric saws or planes. No electric sanders. These small tools were still far in the future. When the ridge beam was in place, with the raking corner rafters, the rest of the rafters were cut and nailed in place. It looked easy, but cutting the correct angles every time took years to learn. Last they nailed in place the eaves boards, ready to take the gutter brackets. Each man had his tools in a circular 'straw', a shallow bag of strong canvas, with two large handles on the rim. Presumably they once made them of straw and the name had stuck. Tools were always laid back on the straw, so that they would not be scattered and lost. Then, when the carpenter was ready to move, the two handles were pulled together,slipped over the shoulder, the straw was tucked under the arm and carried off. It was large enough to hold the longest saw safely and still fold over to protect the ends. At five o'clock each night we children saw dozens of men walking home and could pick out the trades by the different tools they carried. Tools were guarded jealously. A labourer would be told sharply, "Don't touch that saw. You're not a carpenter." Carpenters were skilled men who had served their apprenticeships and did not welcome untrained men. Nor did one carpenter use another's tools. Great offence could be given that way. Each man's tools were marked, burnt in, or deeply stamped, so that there was no chance of the mark being obliterated. When tools had odd initials, there was always a story attached. "From the wife's deceased father"; -"Picked up in Caledonian Market for next to nothing"; - "Bought from a pawnshop window when I was an apprentice." Many of these stories had been polished by telling, repeated on site after site, and no doubt some had acquired truth by the same process. One day we children watched a strange ritual. A carpenter had died. Some of the men who had worked with him for years had gone to the funeral. Now there was a ritual ceremony. The widow, left with her husband's tools, could not face the sight of them. There was no family; nobody who would continue to use them, yet she could not bring herself to sell them. She had asked one of his friends to dispose of them as he thought best. That lunch time, about six men who had known him well sat round in a partly floored room, to eat their sandwiches and drink their tea. Then the straw was opened, heavy with tools. They tossed up for turns like children in the playground and then they each chose a tool in turn as a memento. A wooden smoothing plane, remouthed with boxwood, shining with wear. A cross-cut saw, a carpenter's brace together with a green baize roll of bits. Chisels chosen singly. Tobacco tins of small bits and pieces accumulated over a life-time. Each item was handled carefully and put away by the new owner in its new tool kit, where it would become the subject of a new story. Lastly the leader collected a small sum from each man to buy a present for the widow, a tea tray perhaps, or a vase, as a remembrance. The foreman's whistle went and they slowly returned to work. After the rafters were in position, long tiling battens were nailed in place, but without any roofing felt, or other insulation below them. The tiles would be the sole protection and, from inside the lofts, one would always be able to see the sky through the draughty chinks. When the carpenters left, the roof tilers arrived. Large boxes of red clay tiles had been delivered and now stood around the houses, scattering whisps of packing straw. Labourers stacked the tiles in their carrying hods and climbed the ladders to the top of the scaffolding, holding the ladder with one hand and gripping the hod with the other. They piled the tiles ready for use and the tilers began laying them from the eaves upwards. They hooked the tiles over the wooden battens by their projecting nibs, nailing every fifth row. It seemed too little, but the men assured us that this was enough. Years later I read the amusing account of Samuel Butler's house in New Zealand, where they put the roof on upside down. Samuel Butler, getting as far away as he could from London and his father, the Bishop, became a sheep farmer in New Zealand. There he had a house built in the traditional early colonial manner of earth blocks with a thatched roof. The thatchers were amateurs who started tying in their bundles of thatch from the ridge and worked down to the eaves instead of the other way round. As a result, the open ends of the straw thatch were pointing upwards instead of being protected by the straws above. When it rained, the water ran through the vertical thatch into the house as if the roof was made of bundles of drinking straws. Fortunately, in the Coppetts Road estate the tilers started correctly from the bottom and worked to the ridge. Once there, they cemented round capping tiles in place, along the ridge and down the corner hip rafters. Meanwhile the carpenters were inside the houses, building the floors, fixing the floor joists and nailing down floor boards with heavy cut nails. Large open boxes of these, crudely stamped out of sheet steel, accompanied the carpenters everywhere. The hammer rhythm was absolutely regular. Tap, bang, bang, bang. A light fixing-stroke followed by three heavy blows, as regular as clockwork. One could tell from the outside of the house when a man was nailing floor-boards. With the floors made, everything became more finished. The sawing stools, brought inside, became seats. Staircases, delivered ready-made from the joiners' shop, were fixed, their treads protected by temporary pieces of plywood. Door frames and doors were fitted, skirtings and window sills were cut and fixed. There was a smell of freshly planed wood and men went home with small bundles of firewood. Carpenters had always taken home the short off-cuts from the roofing joists, angle-shaped pieces which would light the fire, or burn as brief logs. Now there was more variety to choose from. No piece of timber longer than seven inches could leave the site. This was a rigid rule and easily enforced by a watchful foreman. One evening I watched a man take a length of floorboard and carefully saw it into seven inch lengths, tie them neatly with string, and put them aside to be taken home. A few years later I went into another carpenter's house where there was a white butler's sink with a deal draining board, neatly pieced together out of seven inch pieces, like a chess board. When the carpenters' work was done, the plasterers moved in. In Finsbury Park, where we had come from, the house had internal walls made of lath and plaster, fine places for mice to run. We had kept down the mice by having a cat, but there was always the danger of mice returning. There were certainly mice in the coal cellar there, but in the new estate lath and plaster walls were banned. All inside walls were built of dark grey breeze-block, thin, hard and solid. No space for mice to run. Only the ceilings were set with lath and plaster: there was no plaster board as this had not been invented. The plasterers brought in trestles and large mixing boards, white with dry plaster. They mixed sand, lime and cement to make a loose, sloppy mortar which they applied with wide, sweeping strokes. Then came a skimming layer of plaster, smoothed and polished by repeated strokes of the trowel. Plasterers were quick-moving, wiry men, all muscle, and we were fascinated to see how rapidly the walls were covered. The dark, wet plaster seemed to set immediately and, two days later, it had dried to the palest of pinks. With the plasterers gone, the houses appeared almost finished. From buildings under construction, they were recognisable houses. Families could almost have moved in, so dramatic was the change. Last came the glaziers, painters and decorators. Crates of cut squares of glass appeared. Glaziers with huge barrels of putty, rolled and pulled and squeezed putty into the window frames, pushed a sheet of glass into the soft putty and bevelled the edge with a quick putty knife. Here again was the speed of men doing a job they had done a thousand times, so that the familiar rhythm of work made the job easier. But their work was silent and intense. Nobody treated glass carelessly. The men never took their eyes off it and as they left, dabbed the windows with whitewash so that nobody would break them by accident. Doors and staircases had come on site ready-primed with pink paint. Now floors were swept, damped to reduce dust, and the decorators in their white overalls painted the woodwork with undercoat and gloss paint in a pale stone colour. The older men had learnt their trade in a much more decorative period, when people had time and money to spend. They would tell tales of elaborate stencil work and mufti-coloured painting, such as they had carried out in big houses in Muswell Hill before the First World War. Elaborate cornices painted in parallel bands of salmon, pale green, dark green, and salmon again; elaborate flock wallpapers, difficult to handle; deal doors painted and grained with a rabbit's tail to resemble oak, mahogany, or bird's eye maple. They came from a world which had been lost by 1925. Some felt that they had come down in the world. To paint a complete house in one colour and then to repeat the same colour all down the road, was against their dignity. However, the immediate job was to get people into decent, clean houses. Perhaps elaboration and the decorators' art would come later. In 1925 they decorated the walls with cheap, bright wallpapers, trimming the edges of the rolls with huge shears, so that we were able to collect handfulls of curly streamers and wrap them round our heads as elaborate wigs. This dressing up marked the end of building. A little carnival to celebrate the completion of the next block of houses. "It would not have been possible to build a 1500 seat cinema in eight or nine months if the Economy had been overheated as it was for example in the 1960s. All contractors employed a nucleus of craftsmen who had started with them as apprentices. In addition, casual labour was hired and fired as there was a large pool of unemployed craftsmen and labourers. At an inspection of one half-completed cinema I condemned a large area of brickwork on the advice of the Clerk of Works. Before I left the site that evening, all the condemned work had been demolished and twenty additional bricklayers had suddenly materialized and were rebuilding the walls."